RHA to launch two pairs of in-ear headphones and its first headphone amp at IFA 2016 | What Hi-Fi? British manufacturer RHA will be taking three new products from its personal audio range to Berlin next week, including its first portable DAC and headphone amplifier, the Dacamp L1. The Dacamp L1 is a fully-balanced DAC and headphone amp with dedicated channel processors. 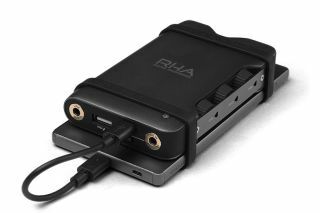 RHA has fitted an ES9018K2M DAC chip and a class AB amplifier for each stereo channel. RHA says this configuration allows the L1 to support the “highest quality digital audio files” from mobile and desktop sources. Hi-res audio is supported up to 32-bit/384kHz and 5.6MHz DSD, while inputs include USB A, USB B Micro and mini digital optical. When playing songs, the L1 will pass them out to your headphones via balanced and unbalanced outputs. RHA has also fitted a a 4000mAh battery to the Dacamp L1, which is said to be good for 10 hours of playback time. The first of the company’s two new pairs of in-ear headphones is the CL1 Ceramic. These have been optimised to be used with amplifiers and feature “two unique transducer technologies to exert unprecedented levels of control over an extended frequency range”. They derive their name from the CL Dynamic transducer, which has been used to take care of bass and midrange frequencies, while a ceramic plate driver handles the highs. In another first for RHA, the CL1s sport the company’s first high-density ceramic housings and a detachable cable system. The CL1 Ceramics come supplied with 11 pairs of silicone and Comply foam ear tips, so finding the perfect fit shouldn’t be an issue. The third product is the CL750 in-ear headphones, which use the company’s ultra-wideband CL Dynamic transducer for “authentic sound reproduction up to 45kHz”. The CL750s take design cues from the MA750 in-ears, with stainless steel housings in an ‘Aerophonic’ design, but they now feature a braided OFC (oxygen-free copper) cable. RHA says the CL750s have an impedance of 150 ohms and so can be comfortably used with amplifiers. They have been certified hi-res capable by the Japan Audio Society. The Dacamp L1, CL1 Ceramic and CL750 will be available from October, priced £400, £350 and £100 respectively.